Disk Utility's Debug menu allows you to see hidden partitions on your drives. 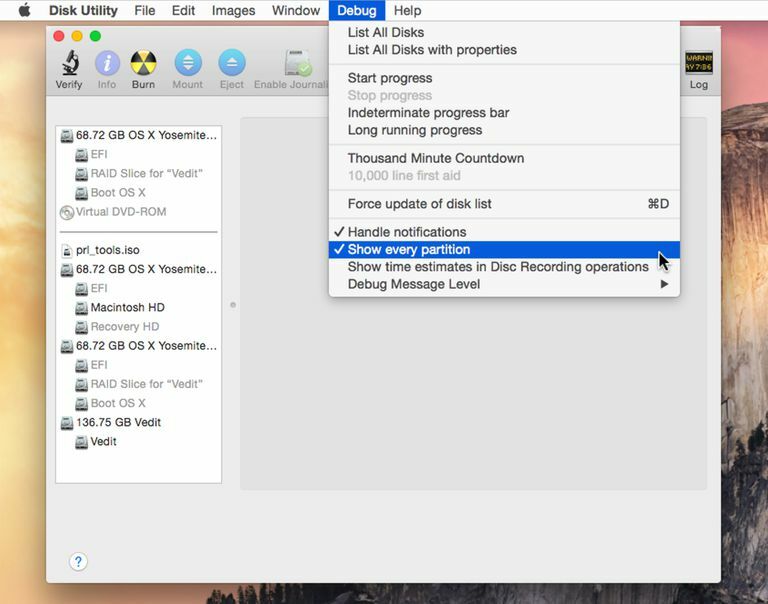 OS X's Disk Utility has a hidden Debug menu that, when enabled, can give you access to a few more Disk Utility features than you normally see. While Disk Utility has had a Debug menu for quite a while, it became even more useful with the advent of OS X Lion. With OS X Lion, Apple added a Recovery HD partition on the startup drive that you can use to boot from and run utilities such as Disk Utility, reinstall OS X, and even access the Internet to find solutions to problems you may be having. The Recovery HD partition is hidden, however, and isn't visible from within Disk Utility. This can lead to a number of issues, including the possibility, over time, of having multiple Recovery HD partitions on various drives as you duplicate drives, replace drives, or re-install OS X. It can also prevent you from moving the Recovery HD partition to a new drive, should you ever need to replace a drive or just want to move things around on your drives. Disk Utilities Debug menu has quite a selection of capabilities, though most are designed for developers to use in testing apps that may work with the Mac's storage system. Most items are benign, such as List All Disks, or List All Disks with Properties. There is also control of how a progress bar is displayed, whether to turn on a Thousand Minute Countdown. The countdown just changes the Console logs for Disk Utility to show 60,000 seconds or one thousand minutes. The purpose is just to have a finer grain display of when log events occur. Once again this is really just for those developing storage products for the Mac. Force update of disk list - As the name implies, this will cause Disk Utility to update the disks listed in the sidebar. This can be useful when you have attached or removed a disk while Disk Utility is open. Show every partition - which as its name implies will display all partitions on a Mac's drive even if they are meant to be hidden. It's understandable why Apple wants to hide some of the Recovery HD partitions. For instance, when you format a drive, the process creates a small 200 MB partition that the EFI bios needs for booting. These small EFI partitions don't contain any data that end users need, and there's no reason for them to be visible. But if you would like to be able to access the OS X Lion and later's Recovery HD partition to create clones or backups, enabling the Debug menu in Disk Utility is the easiest way to see and work with these invisible partitions. With the release of OS X El Capitan, Apple finally decided to remove support for Disk Utilities hidden debug menu. This means the Terminal commands outline below will only work for versions of OS X Yosemite and earlier. Quit Disk Utility if it is open. The next time you launch Disk Utility, the Debug menu will be available. If you wish to turn the Debug menu off again, perform the following steps. Don't forget that disabling Disk Utilities Debug menu does not reset the commands within the menu to their default state. If you have changed any of the settings, you may want to set them back to their original condition before disabling the Debug menu. Then press enter or return. Terminal will display all of the partitions currently connected to your Mac. That's all there is to enabling or disabling the Disk Utility Debug menu. Go ahead and see what features are available under the Debug Menu, you will probably find the Show every partition item and the Force update of disk list item the most useful.